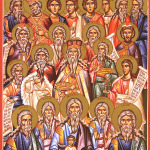 DEC 15: DIVINE LITURGY – 4:00 PM; DEC 16: TYPIKA – 10:00 AM; DEC. 18: – 6TH HOUR & CATECHISM – 11:00 AM. Today’s Gospel is from Luke 14: 16-24, The Parable of the Great Banquet. This story was told at a dinner that Jesus attended. Jesus just healed a man with dropsy & taught a brief lesson on serving others. Jesus then says that those who serve others “will be repaid at the resurrection of the righteous.” At the mention of the resurrection, someone at the table with Jesus said, “Blessed is the man who will eat at the feast in the kingdom of God”. In reply, Jesus tells the Parable of the Great Banquet. In essence, the parable tells us that the master is not satisfied with a partially full banquet hall; he wants every place at the table to be filled. Those who ignored the invitation to the banquet missed out for they would not “taste of my banquet.” So it will be with God’s judgment on those who choose to reject Christ: they will have their choice confirmed, and they will never taste the joys of heaven. The Second Sunday before the Nativity commemorates the Ancestors of Holy God the Son within the Holy Trinity/Our Lord, God, and Savior Jesus Christ. 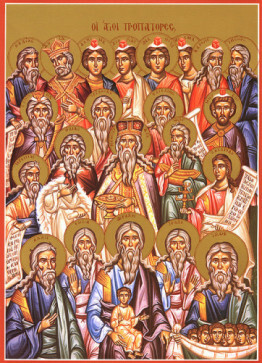 All the great Fathers and Mothers and Prophets of the Old Testament, starting with Adam, Abraham, Isaac and Jacob, including Holy Prophet Elias the Thesbite and Daniel, and concluding with Holy Prophet Zechariah (Zachary), Holy Prophet and Glorious Forerunner John the Baptist and The Theotokos.